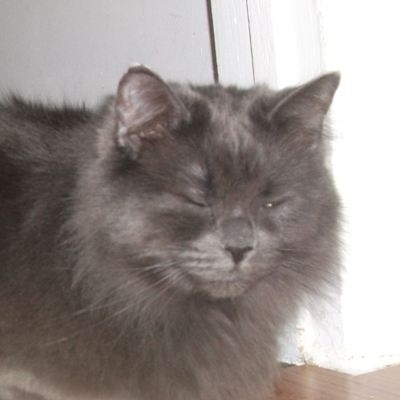 Odessa is a beautiful medium-haired Russian Blue cross who was rescued from a wood pile, along with her five kittens – Caspian, Jules, Nereida, Nerissa and Hadrian. Although she has adjusted well to living indoors, she remains somewhat timid and prefers to watch the action from a distance. She will allow herself to be petted, but does not like being picked up. She does however, enjoy interacting with the other cats in the foster home. Odessa would do well in a quiet home without small children, and with someone who is willing to let her blossom in her own time. Her picture does not do her justice. In order to find this sweet girl a home, we are waiving our usual adoption fee in lieu of a minimum donation of $85.